We are very happy to announce our collaboration with STIRIXIS Group, as a member of the architectural design team! STIRIXIS Group is an internationally awarded strategy-through-execution consultancy firm that ensures your long-term success. We create, design and manage business concepts globally, in the Retail, F&B, Hospitality and Leisure industries. We give our clients practical strategic advice based on a clear understanding of implementation, as well as executional skills based on a profound understanding of the business context. Our latest project was just delivered! The renovated space of Global Prep finally reflects its vibe, being colorful, dynamic and inspiring! We couldn't ask for a more wonderful client, or a better working team. Click on the image above to see all the details, more photos and the amazing group of collaborators that worked on this project. ​Stay tuned as a new project is coming along, in collaboration with Demi Tsirigotaki, interior designer, and Hellodesign! ​ Dimitris Sakellariou-Tailor Made Architecture. As contemporary demands in property development call for interdisciplinary approach and cooperation, especially in the frame of Tailor-Made Services towards any client, our team of collaborators from different specializations guarantees maximum professionalism, effectiveness and confidentiality. b. the improvement of existing buildings. Moreover, the network includes a wide range of technicians and technical companies that specialize in building’s construction, upgrade and maintenance and can undertake any project. DS-tma's Philosophy is to offer High Quality architectural services made-to-measure to the client's necessities. The way to offer High Quality [HQ] Tailor-Made [TM] Architecture is the application of step-by-step integrated management of any project. Elena Gianpapa gave a lecture at School of Architecture, NTUA, in Athens, Greece, as part of the seminar "Schematization as a Landscape interpretation method", an advanced theory class of the postgraduate program "Ms in Architecture Spatial Design // Architectural Design - Space - Culture", taught by Professor Constantinos Moraitis. 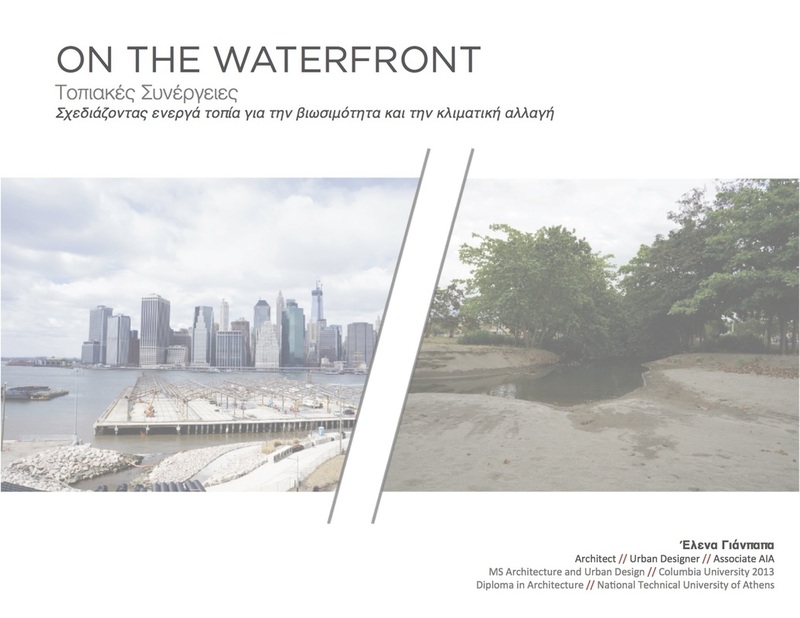 The lecture "On the waterfront" // Spatial Synergies // Designing active landscapes for sustainability and climate change", focused on spatial strategies in the United States, presenting some of the Rebuild by Design projects in New York, and selected work of Local Office Landscape Architecture, in New York and Puerto Rico.